Cartridge yields approximately 220 pages. Consistent quality with advanced inkjet technology. 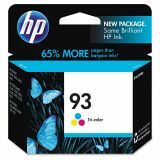 HP 93, (C9361WN) Tri-color Original Ink Cartridge - HP 93 tri-color photo ink cartridge works with the Hewlett-Packard Deskjet D4145, D4155, D4160, 5440, 5440v, 5440xi; Photosmart 1507, 1510, 1510v, 1510xi, C3135, C3140, C3150, C3180, C4150, C4180, C4140 and 7850. Get fast results and superior fade-resistance while using less ink with HP's Vivera inks. Make your memories last with photos that resist fading for generations. Automatic screen alerts let you know when a cartridge is running low or needs to be replaced. 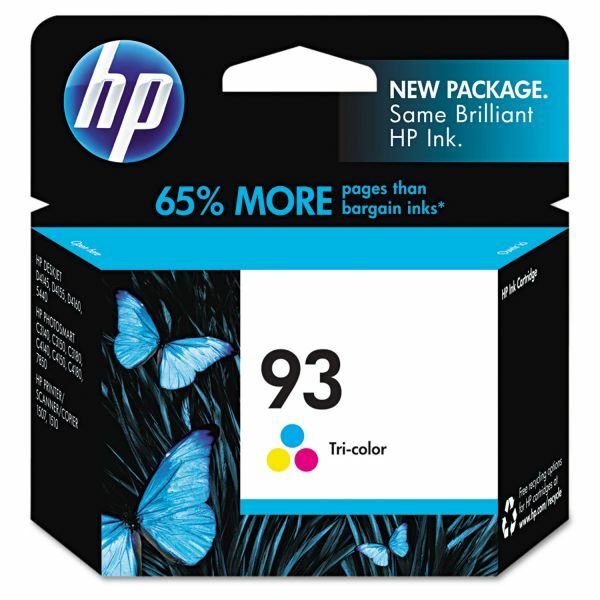 Cartridge yields approximately 220 pages at 5 percent coverage.